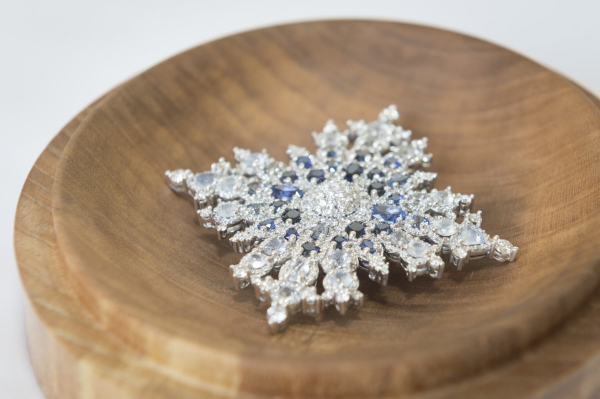 Winter is knocking on the door here in the Northern Hemisphere, and with the changing season, I wouldn't be surprised if we see today's brooch, the Sapphire Jubilee Snowflake, make another appearance soon. Queen Elizabeth II of the United Kingdom celebrated her Sapphire Jubilee in 2017, marking an astonishing 65 years on throne. But of course, the UK isn't the only country where she has reigned for so many decades; she's also monarch in several other realms. 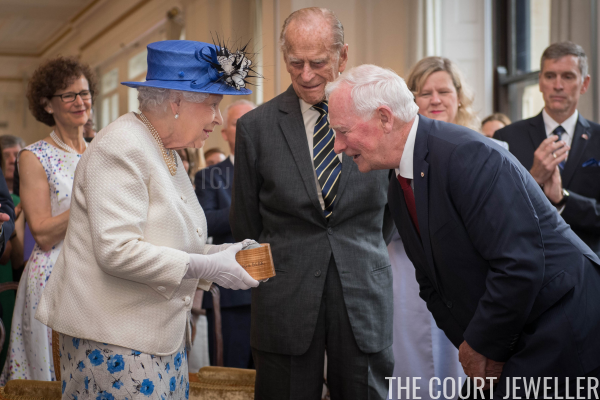 To mark her Sapphire Jubilee as Queen of Canada, Governor General David Johnston presented her with a gift on behalf of the nation: a lovely new diamond and sapphire brooch. 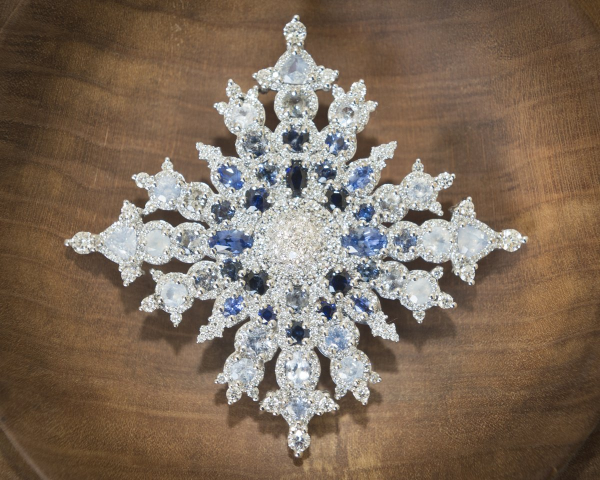 The brooch features diamonds and gorgeous pale blue sapphires in a snowflake-inspired design. (The scientifically-minded among us will undoubtedly note that it's not really a snowflake, as they feature six-fold symmetry, and the brooch does not.) The sapphires set in the brooch were part of a cache found in 2002 on Baffin Island by a pair of brothers, Seemeega and Nowdluk Aqpik. 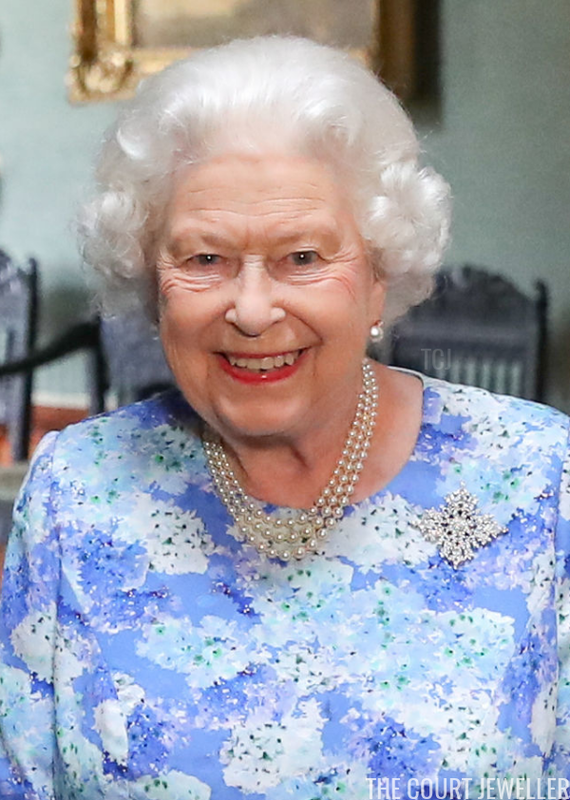 The brooch was made by a Canadian firm, Hillberg and Berk, and was designed as a companion to one of the Queen's most famous Canadian-related brooches: the Diamond Maple Leaf Brooch. Appropriately, the Queen was wearing the Maple Leaf during her visit to Canada House in London to celebrate the 150th anniversary of Canada's Confederation. 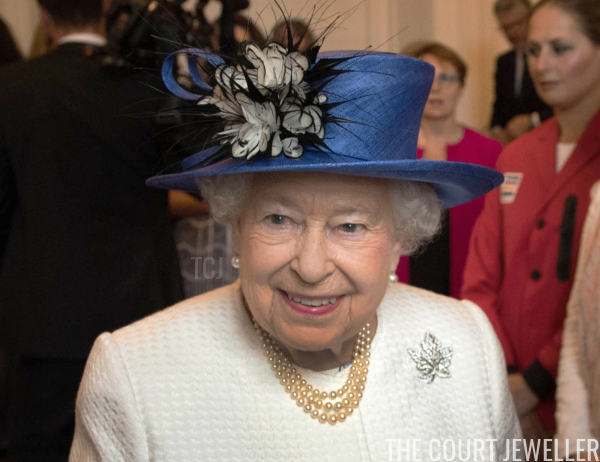 During that visit, Johnston took the opportunity to present the Queen with the new snowflake brooch. Here's a better look at the Queen from that occasion. 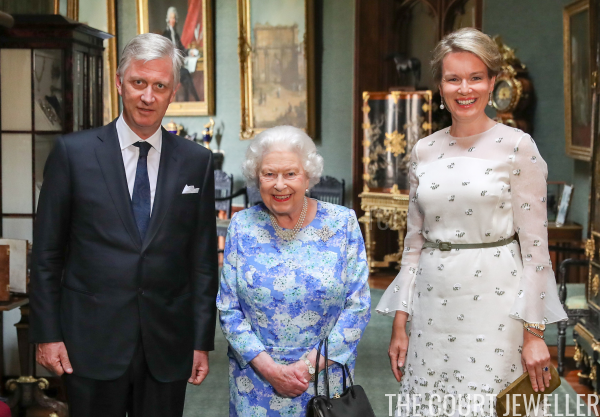 Unfortunately, the brooch receded a bit into the colorful dress that HM wore for the day, making the sapphires almost disappear entirely. Here's hoping that we'll see her wear the piece again soon, and on a dress or coat that helps the brooch pop a bit more. The chilly weather will surely provide plenty of appropriate opportunities for a snowflake outing!